Give your students fun, interesting and educational history books. We’re probably all familiar with the phrase, “Making history come alive.” This is what homeschoolers want for their students, something they are not going to get in a history textbook. Textbooks, for the most part, are boring. There’s good information, nice photos (if you’re lucky) and review questions at the end of each chapter (if you’re not so lucky). Remember those review questions? Here’s how I handled those: I read the review questions first and then I looked through the text for the answers. Once I had all the answers I was done. And boy was I done. From the pages of the book into my brain, onto the paper and then a direct, straight, unwavering path out of my brain and into the abyss. It was drudgery and I didn’t learn anything lasting. What I learned watching my wife homeschool our son is that it does not have to be that way. Unlike me at his current age (21) my son loves learning. He reads all kinds of things and is interested in all kinds of things. I like to think (I can’t prove this) that because learning was fun for him as a child he has none of the baggage about learning and education that many of us who went through traditional education have. This is not across the board. Some kids thrive in traditional education. But I was not one of them and we knew our highly dyslexic son would not be one of them either. When he was in 8th grade, after being homeschooled his entire life, he went to a charter school for a semester, a very well-respected charter school in the San Diego area. What did he get? Worksheets and textbooks. We watched our son’s love of learning begin to deteriorate. We pulled him out after that semester and never looked back. There are hundreds of real books out there to help your students learn history and have fun doing it. 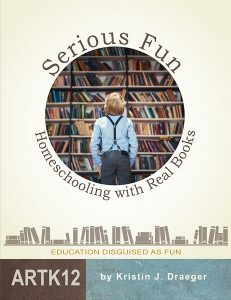 ARTK12’s Serious Fun: Homeschooling with Real Books lists 36 pages of history books for your students grades 3 – 8. These are fun and educational books that your students will want to read or have read to them. What does Kristin mean by “real books.” Real books are not the dry, unimaginative textbooks that come with sets of curriculum, but fun books from the library or bookstore that were written to engage, inspire, educate and entertain children. Real books are books that have been written by real children’s book authors not a panel of textbook editors. Below is just a small sample of some books listed in Serious Fun. Clicking any book will take to you Amazon.com.